Blackie Sherrod was a Texas legend. The hard-bitten old sports scribe routinely cried out for more “punch and juice” from his fellow writers. He liked to go deep and he expected those around him to follow. “There was this beer sop Meskin food place called Shanghai Jimmy’s, and if we didn’t eat there two night a week our faces would break out…” said Sherrod. Sherrod’s words became part of the lore of Shanghai Jimmy’s Texas Chili Rice. Jimmy James Skaliski claimed he introduced chili to China during the Boxer Rebellion. It didn’t matter that the Society of the Righteous and Harmonious Fists had been put down like rabid dogs come 1901, it became part of the legend of Shanghai Jimmy. Skaliski was born in Jackson, Minnesota in 1903, he mustered out of the U.S. Army on December 10th. 1922 while stationed in the Philippines. A year later he was coaxed by the US government into the position of Deputy Marshal in Shanghai. In May 1924 he opened a burger joint in Chefoo, on the north coast of Shantung in North China. Jimmy James concentrated on feeding military men as foreign naval conscripts were chockablock in the region. Skaliski would go on to open a proper restaurant in Shanghai’s docklands called The Broadway Lunch. Chili Rice was born when a native asked after a substitution of rice for the beans as the starchy foil to the meaty chili being served. 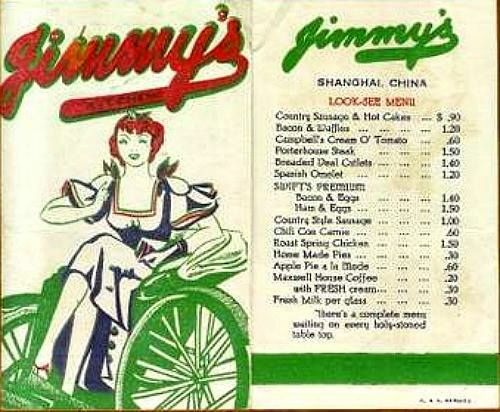 That sole restaurant would lead to a small chain of Jimmy’s Kitchens scattered across Shanghai. In 1927, Skaliski met Aaron Landau and an empire began to take shape. 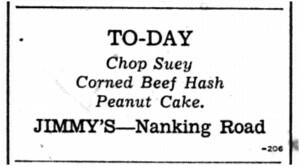 In 1928, Landau hatched a scheme to open a Jimmy’s Kitchen in Hong Kong. By 1928 he had done just that, opening a cafe near the Seamen’s Institute. Landau and Skaliski never lost any money feeding navy men. Aaron Landau’s son Leo came aboard in 1934 and the team moved the Hong Kong Jimmy’s Kitchen to the China Building near the Queen’s Theater. All was harmonious and the various restaurants run by Jimmy James and the Landaus made the concern plentiful money til December 18th 1941 when the Japanese invaded Hong Kong. They were merciless, and young Leo Landau was sent to a war prison in Sham Shui Po. Shanghai Jimmy did not fare any better. Along with his wife and children he was interned in Chapei Civilian Internment Camp near Shanghai. The Japanese recognized who they had, and Jimmy was soon cooking in the camp’s kitchen. Come 1945 the Japanese were licked. The Chinese had lost 14 million citizens to the war but the conflict was decided in their favor. On August 15th 1945 (August 14 in the United States) Emperor Hirohito took to the airwaves: “Should we continue to fight, it would not only result in the ultimate collapse and obliteration of the Japanese nation but would also lead to the total extinction of human civilization.” Shanghai Jimmy was back in business. It was short-lived. As Mao’s communist forces maneuvered south in the summer of 1949 foreigners decamped as the Cultural Revolution began. The Maoists would have to do without Shanghai Jimmy’s Chili Rice as Skaliski fled to Tyler, Texas USA. Shanghai Jimmy’s US iteration was properly born in the Rose City with his first stateside restaurant. But the restaurateur was too big of a personality for Tyler, and soon set off for the big city of Dallas where his Shanghai Jimmy’s Chili Rice cafes became legend. Journalists have big mouths and when they get excited they tend to crow about it. And crow they did. Giants like Bud Shrake, Jenkins, Puss Ervin, Jerre Todd, Gary Cartwright, and Charley Modesette were all regulars at Shanghai Jimmy’s and they were also gainfully employed at local newspapers. Hard-drinking newsmen can offer all sorts of material support to restaurant owners. “Chili rice is very nice.” soon became a regional saying, and part of Shanghai Jimmy’s ad campaign. From an old John Anders column: “Elvis always ordered the number 9 tub; the works- chili, rice, onions, cheese, celery and relish”. Speaking on the king Shanghai Jimmy said “he was always polite”. Jimmy James Skaliski’s chili rice is still spoken of in hallowed terms nearly 30 years after his passing. John Anders penned his obit June 18th 1990. ½ teaspoon red pepper (this is his recipe. He means cayenne pepper. Allow about 2½ hours to prepare. Heat two tablespoons cooking oil in a skillet over medium heat. Add the chili meat and fry for 15 minutes. DO NOT STIR THE MEAT. Turn the meat, without stirring, and cook for another 10 minutes. and add to this stock. Add the bay leaf. Add one additional cup of water. meat itself. Cook this for 1½ hours over low to medium heat (slow boil). You may cover the pot if you wish. At about 1 hour and 20 minutes combine the following ingredients in a mixing bowl: Sugar, salt, red pepper, black pepper, garlic powder, cumin, chili powder. Mix the flour and the corn meal well. You do not want any lumps in this. Then add ¾ cup of water to form a watery paste. Once again stir well to eliminate any lumps. Then add this mix to the chili. This is the thickening agent. Stir well and continue stirring for 5 minutes at a slow boil. or 4 tablespoons of sherry if you like. Whatever you use, stir it in well. Yes, during my ramp up I noticed that many people made the same claim. Thanks for the tip.